The term Frankenfooty is a bit misleading. At least Dr Frankenstein, however misguidedly, did create a monster. In the case of Essendon, despite the lofty goals in the paragraph above, all that happened was that the players were exposed to worthless or unproven treatments at best, and rank pseudoscience at worst. It’s important to note that Essendon has denied the charges and has called for a public hearing by an independent arbiter. 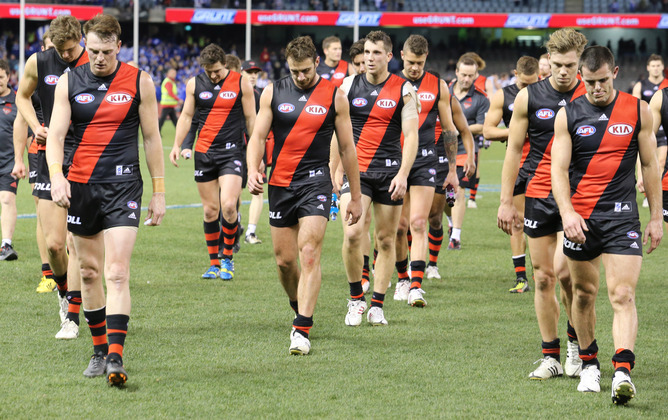 It seems Essendon’s most valuable assets, its players, were exposed to potential harmful treatments that flew in the face of the very science on which they sought to base their program. So, what are the supplements allegedly involved, and what are they supposed to do? You can find the details on most of the drugs in this list at our Sports Drug Glossary. I’ll mention some in more detail shortly. There are some that you won’t find in the Sports Drug Glossary. Actovegin®, an extract from calf’s serum, is suggested to improve sports performance. It is not approved for use in Australia, and has little evidence of efficacy. TA-65 is an experimental telomerase inhibitor which might have benefits in cancer and aging, but none in sports performance. Traumeel is a “homeopathic” herbal preparation (which actually has ingredients in it) used for treating pain and inflammation. Traumeel might possibly work, but the evidence is still weak. The above list is not exhaustive, there were far more drugs the players were exposed to. The document alleges footballers were given infusions of vitamin C, which are worthless, and have a possibility of producing kidney stones. The anti-Alzheimer drug cerebrolysin that appears on the AFL list might, just might, possibly reduce the possibility of brain injury, it is currently not licenced in Australia for this purpose. What was the “supplement protocol”? At the centre of Essendon’s plan was a program of treatments, the supplement protocol, (first mentioned on page 12) of the following four drugs: AOD-9604, thymosin, colostrum and tribulus. AOD-9604 and thymosin were injected: AOD-9604 weekly for the season, thymosin weekly for six weeks, then monthly. AOD-9604 was developed as an anti-obesity drug. It is a small peptide that mimics part of the growth hormone molecule which increases fat metabolism and decreases the production of fat. AOD-9604 failed in clinical trials against obesity and there is no clinical evidence that it helps in any sports-related manner. It is not registered in Australia. Thymosin beta-4 is a protein that binds to the cell’s cytoskeleton (which is like a cellular skeleton). It may have a role in in cell survival and the repair and regeneration of damaged tissue, but human clinical trials are limited. It is not approved in Australia. But the sports scientist at the centre of the current saga, Stephen Dank, claims the thymosin he injected the players with was not thymosin beta-4. Colostrum is the very early form of milk secreted late in pregnancy and in the first few days after birth. There’s little evidence that colostrum consumption (typically cow colostrum) improves team sport performance. While not directly banned, colostrum could stimulate insulin-like growth factor-1 (IGF-1) secretion. IGF-1 is banned, but stimulation of its secretion by nutritional supplements is a grey area. Tribulus, or rather Tribulus terrestris is a herbal medicine which is supposed to naturally increase testosterone levels. While it is popular with body builders, clinical trials have failed to show any effect of this herbal supplement on either testosterone levels or muscle development in sport. What is the possible impact of these supplements? I’m a toxicologist, rather than a sports scientist, but the research evidence looks rather clear. For the drugs in the “program” (AOD-9604, thymosin, colostrum and tribulus) there is no good evidence that they do anything useful in either enhancing performance or increasing recovery from injury. The combination of these drugs has never been tested, but given their lack of individual effects I would be surprised if they had any effect in combination. While the individual drugs have only minor side effects reported, exposures of the duration used by Essendon have not been carefully studied in the long term, nor have combinations been studied. Also, in the list of charges the actual concentrations of the drugs in the formulations are not reported, so it is hard to determine if the doses alleged are consistent with the few clinical trials run. While Essendon started out with the goal of developing a scientific supplementation program that would push, but not break, the rules on doping, what they ended up with was a nonsense. While the focus has been on whether or not any given supplement was allowed or banned by the rules, a far more significant point has been missed. The charges document notes Essendon players were repeatedly treated with drugs that had no proven benefit of any kind. Any proper scientific due diligence would have pulled that up. While the side-effects of these treatments are minor (to the extent that we know), any side-effect for a treatment that is ineffective is unwarranted. Not to mention that any injection has a slight risk of infection. Given that the players allegedly had multiple injections, the risk to the players was compounded. Basically it seems the players were being given risky placebos, with added pseudoscience. Dr Frankenstein created a beast of horrifying power; Essendon just created a shambles. Ian Musgrave is Senior Lecturer in Pharmacology at the University of Adelaide. This article was originally published at The Conversation.